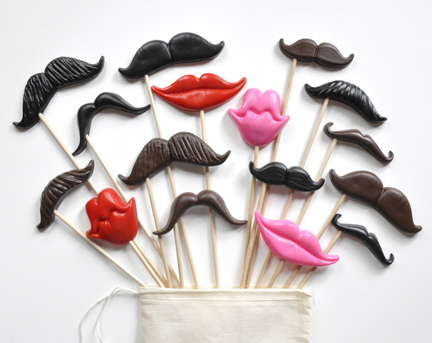 We welcome large orders and are happy to provide generous bulk savings for those customers who need a large quantity of mustache and smile props. For bulk orders only, we are now offering machine-made props that are based on our most popular handmade designs. Doing so allows us to produce large quantities faster and with consistent colors, plus we are able to provide better bulk rates. These machined props are very similar to our handmade ones—take a look at the image below and see for yourself. The differences are minor. We chose our top selling eight designs to be manufactured by machine, and each one has two colors available. Our bulk props are still made in the USA (Valdosta, GA), and they're still BPA- and phthalate-free. We can produce large orders fast. But better than that, we can offer really competitive prices on these props with a minimum purchase of 20 pieces. Our manufactured props with wood dowels are now $1 each with a purchase of 50 or more. For quantities less than 50 pieces, the price is $1.50 each with wood dowels. These bulk prices apply only to unassembled machined props and are subject to change. Coupons and discount codes do not apply to wholesale orders. There is a slight up-charge for steel rods. There are eight machined prop styles with two color options for each, allowing a total of 16 variations. Additional styles and color options are available with our handmade props, available in our Prop Shop with prices starting at $2.99 per prop. Bulk purchases may be ordered assembled (attached to sticks) for an additional charge. We are happy to ship bulk orders anywhere in the world. Most bulk orders can be ready to ship within one day. Assembled orders require more time, and very likely can be shipped within three days. Please contact us to inquire about shipping. To place a bulk order, please shop here. Designed for resale, our Double Date Prop Kit is ideal for a DIY photo booth experience. Each kit includes 4 different props (two mustaches, two smiles, each in a different color) and includes a full-color photo booth sign. Wholesale prices can be found here. From parties to weddings and birthdays to reunions, we've created a large variety of plastic signs and offer discounts on them, too! Our current sign designs can be found in our online Prop Shop. Sign sets of 5 (Party, Reunion and Wedding sets) are automatically discounted by 10%. For 20+ signs of any assortment, we’ll provide a 15% discount. For 30+ signs, we’ll provide a 20% discount. Discounts do not apply to our clearance signs. Please contact us directly to take advantage of these savings. We offer bulk rates on our handmade props, too! Our full range of current prop styles can be found in our online Prop Shop. 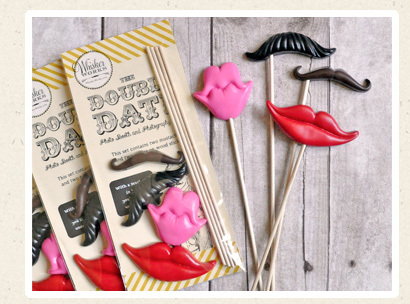 Whisker Works offers comical mustaches, smiles, ties, pipes and glasses on sticks that are sure to add a hilarious twist to any celebration! Whether used as wedding or party favors, silly photography props, photo booth accessories or for personal entertainment, nothing says fun as uniquely as Whisker Sticks. Molded in hard plastic, all props are very durable and strong. They’re also easily cleaned with soap and water, which makes them more sanitary than paper and felt props. For added strength, steel rods are available in place of standard wooden dowels. This is highly recommended for photo booth rentals. We welcome custom mustache designs as well as custom orders. Are you a retail store or boutique interested in carrying Whisker Works props? Email us!